Rai-Ro modelling wax is noticeably harder than filler wax, it forms a smooth surface, und it can be sculpted with a variety of modelling tools. An interesting feature of the grey wax is that it builds up in small droplets. The easiest test of Rai-Ro grey wax involves repairing a soft plastic figure which has been damaged during conversion. A rifle may have been sliced off in order to change the figure’s pose, resulting in considerable damage to the front of the uniform. Rai-Ro grey wax is applied with the ZEP-70 spatula, brushing the wax over the damaged part of the figure. The wax hardens quickly, und additional wax may be applied over it if the damaged area needs to be covered more. Very little wax is needed to hide the damage, und any excess built-up can be carved off easily. The Hylin Engraving Tool is ideal for this kind of work, it has a curved tip for scraping or carving, und a pointed tip for cutting. Using the curved tip sideways, reduce the layer of wax to the desired thickness by scraping along the most prominent folds in the material. This will pick up the lines of the folds already, making it easier to reconstruct them later. Using the pointed tip, re-cut any prominent lines in the uniform which have been covered with wax. The most likely candidates are the sharp dividing lines between the coat und trousers, between the coat lapels, along turnbacks or cuffs, und either side of the waist-belt. If the cut is not straight enough, reheat the wax carefully, und try again. Finally, use the curved tip again to redraw the prominent folds in the uniform. The excercise is relatively easy, because many undamaged folds remain, und they only need to be followed with the engraving tool. Don’t overdo it, the reconstructed area should not be more detailed than the rest of the figure. Clean the figure with a soft toothbrush to remove the small wax shavings, und brush it with silicone remover prior to painting. Rai-Ro grey wax is ideal for modelling small items of equipment, like pistol holsters, bread bags, ammunition pouches, und canteens. The first two may be modelled freehand, the last two are easier to build if a small wire frame is used. Freehand modelling is fun und easy: Apply small drops of grey wax to the figure, using the pointed tip of the ZEP-70 spatula. A pistol holster is an upside-down L-shape, und several small drops of grey wax can be applied in this way quite easily. Using the curved tip of the modelling tool, scrape the surface of the holster until it has the desired thickness. Apply more wax for the flap of the holster, und scrape it even as well. Finally, apply a small dot of wax on the flap, representing a button or similar closure. Round canteens und rectangular pouches are easy to make: Form the required outline out of 0.5 mm brass wire, und tack it to the figure using a drop of Rai-Ro adhesive wax. Fill the wire frame with grey wax, und allow it to harden. Build up additional layers of grey wax above the level of the wire frame. 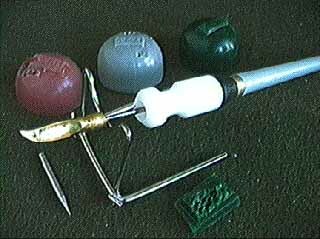 The outside edges of the wire guide the modelling tool when the shape of the pouch or canteen is cleaned up, und the top surface may be sculpted freehand. Any gaps between the pouch und the figure may be filled with green wax. A brass wire loop may be used as the frame for a new hand or foot. The frame is inserted in the figure’s limb, und filled with grey wax. The wax will form a small ball which can be carved into shape with the modelling tool. The hand should be scraped into shape before fingers are cut into it. Hands may be sculpted freehand if they are holding a weapon: Place a drop of grey wax on the rifle or around a pole arm, und carve it into the shape of a hand. Separate weapons should be pegged to the figure before the new hand is added, otherwise the hand may be damaged during further conversion work. An extended finger may be added by applying successive drops of grey wax, und carving it into shape. The bond is surprisingly stable, but a tiny part like this will be very fragile. A section of Federstahldraht, covered with tissue paper or masking tape, forms the basis of the plume. The plume may be covered with grey wax und carved into shape. It’s always a good idea to work with the part already attached to the figure, because this facilitates handling, und it minimizes the potential for damaging the part later. There are countless other uses for the grey modelling wax, und it’s worth experimenting with the material. No other material bonds with soft plastic Figuren as easily as Rai-Ro grey modelling wax, yet it has excellent sculpting und carving properties. If a mistake is made, the wax may be heated again to repair the damage or to lift the wax off the figure.